New Horizons Service Dogs, Inc. is a non-profit 501(c)(3) organization that partners trained dogs with the disabled, mostly in the area of wheelchair and mobility assistance. We are headquartered in Central Florida and provide service dogs to disabled clients primarily throughout the state of Florida. Please explore our website. You’ll find out more about our organization, what a service dog is and how to treat one, how to become a puppy raiser, how to apply for a dog, and how you can help us. We also have pictures of pups-in-training, graduate dogs, and informative links. We train our service dogs primarily to assist adults and children in wheelchairs and also to assist those individuals with other mobility and balance problems. We have specialized programs for veterans with disabilities and children with autism. We also have facility dogs assisting in other working situations such as rehabilitative facilities, nursing homes and private homes, depending on the dog’s temperament and abilities. Please explore Our Programs for more information about our raising and placement programs. New Horizons Service Dogs, Inc. is a Florida-based, not-for-profit, 501(c)(3) organization that breeds, raises, professionally trains, certifies, and places service dogs with individuals who have mobility and balance problems. We have specialized programs for wounded war veterans, veterans with PTSD, and children with autism. We also have facility dogs assisting in other working situations such as rehabilitative facilities, nursing homes, and private homes, depending on the dog’s temperament and abilities. Since 1995, we have successfully trained and placed almost 700 service dogs with recipients throughout Florida. Our dogs assist individuals by performing daily tasks such as pulling wheelchairs, opening, and closing doors, helping with laundry, turning light switches on and off, retrieving dropped items, bracing, getting a phone in an emergency, and preventing a child with autism from wandering off. New Horizons Service Dogs provide a lifetime of unconditional love and service. They increase our recipient’s self-sufficiency, independence, mobility, self-esteem, and social interactions. Our dogs enable their partners to attend school and gain employment. Service dog ownership is linked to improved health, fewer doctor’s visits, better self-care, and improved overall quality of life. Janet Severt is not only the Founder of New Horizons Service Dogs, Inc., but she is also a service dog user. “My dog can pick up dimes or credit cards off my tile floor,” explains Severt. Since age 7, Janet has been a C-5, C-6, C-7 quadriplegic suffering from arteriovenous malformations. In 1968, she began puppy raising seeing-eye dogs, and has dedicated her life to helping people with disabilities using service dog’s others ever since. The service dogs, as well as potential recipients must go through rigorous training. For about a year-and-a-half, the dogs are rotated between foster homes and the prison program where inmates raise them. The dogs then return to New Horizons, where the staff perfect and work on the 80 commands the dogs are taught. At this point, matches of the dogs and recipients are made. Personalities of both the dogs and recipients are considered. The recipient must then go through a two-week training program of in-classroom learning, including a written exam at New Horizons, and be tested with commands in public surroundings with the dog. Currently, there are 139 people, equivalent to 1+ years, on the NHSDI’s waiting list to be matched up with a service dog. In general, the cost for breeding, training, and placing a service dog can range from $20,000-$38,000. 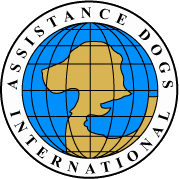 The dogs are provided free of charge to recipients, however, we ask our recipients to assist with fundraising. New Horizons has graduated over 500 recipient/dog teams!